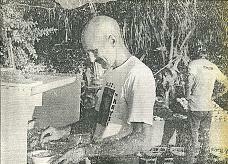 Ron Carter, The Noodle Man, sells bowls of Italian and Chinese pasta at the Mallory Square Pier. Ron Carter is a man who used his noodle and found a career. Returning to Key West years after a stint in the Navy and a brief career popping the heads off shrimp, Carter went to the Mallory Square Pier to watch the nightly sunset celebration. "I fell in love with it and decided I needed to do something down there," he said. He quickly followed his urge, and within a week, Carter was in business. He built a vendor cart, bought some boxes of imported Italian pasta, created some tasty receipes - and in the process changed his life. He has been on the dock for about three years. Known better as The Noodle Man, Carter makes his living selling bowls of Italian and Chinese noodles, as well as his specialty, linguine with white clam sauce. In addition to cooking his noodles and preparing the toppings from scratch, he makes sure the tourists on the dock know he's there. Carter, who sports a bald head and a Fu Manchu mustache, uses his rich, baritone voice and eccentric appearance to hawk his cuisine. "Every luscious order cooked right before your very eyes," he proudly announces to passers-by. Noodles are Carter's life. Boxes of vermicelli are stacked high along a wall in his Key West apartment. On the dock, Carter, 48, drops noodles he has precooked into pots of boiling water, then slices, dices, and adds the ingredients. His customers eat within 30 seconds of ordering. The Noodle Man's cooking method is a virtual whirlwind of motions, with arms wildly moving from the boiling pasta to the onions to the soy sauce to the cheese. He sells between 40 and 100 orders a night, depending on the time of year. Wanda Brine, the dock manager at the sunset celebration, said Carter adds lots of flavor to the event, where hundreds of people gather each evening to watch the sun sink into the Gulf of Mexico and buy pieces of art, munch on food and be entertained by street performers. "He's unusual. He speaks his mind and is not afraid to do it," Brine said. "He makes the celebation a little more interesting." And the completely bald Noodle Man makes this guarantee about the quality of his pasta dishes: "No hair in my food."